I wanted to treat you to something especially gorgeous to think of this weekend. I mean, wouldn't you just love getting this beautiful necklace in your stocking on Christmas Day? As homage to the artist Frida Kahlo, jewellery designer Dori Csengeri has created this hand embroidered Haute Couture necklace which I think has something extra warming - perfect to liven up outfits during this cold season. Can you just imagine it on a long white dress? 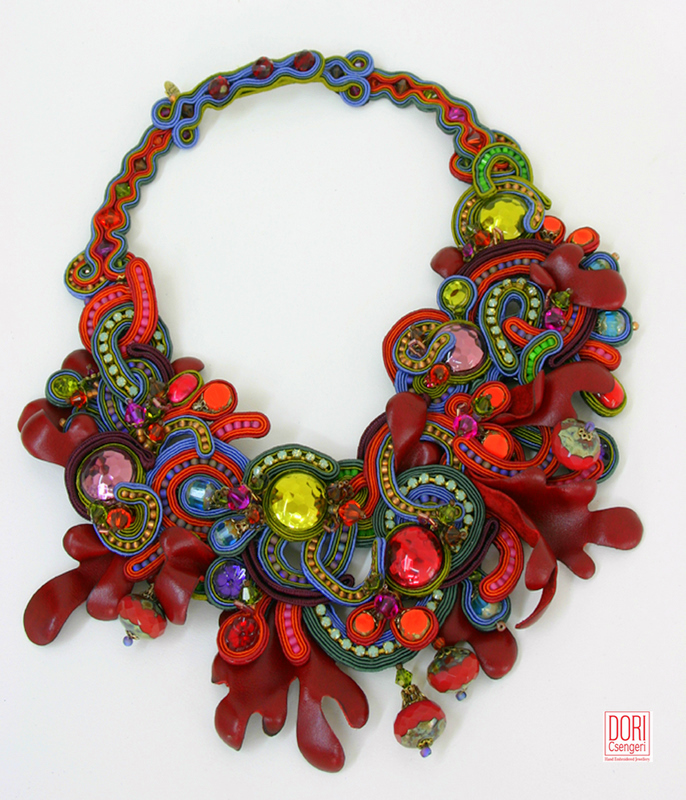 Dori's love of colour, a long tradition of hand embroidery and textile design are combined together through an ancestral technique of assembly with needlework of silky cotton cords. Such scene-stealing creations are made in Dori Csengeri's atelier using cabochons, fine stones, crystals, bohemian beads, shell, wood or metal and leather-backed for comfort. Dori Csengeri regularly collaborates with Swarovski and she has designed for Swarovski’s Jewelry World Facets 2011 Collection, Swarovski’s Crystallized™ trend inspirations or, the Atelier Swarovski collection. Today Dori Csengeri is an award winning, internationally acclaimed artist, with offices in Milan, Paris, Barcelona, New York and Tokyo. Read more about Dori Csengeri here and here. Please next time take some pictures I love to travel so much ! What a riotous cornucopia of colour and energy at work in this eye-catching piece. Striking indeed, and oh-so-fun! Thank you for posting about it. This necklace is stunning, as is your blog!